The Bodyclock Classic Radio Alarm Clock gently wakes you up in the morning, and sends you to sleep at night, with a 30 minute sunrise and sunset feature. Designed as a gentle light therapy, it's a much more gentle way to wake than an abrupt alarm call. But for those who need it, the Bodyclock Classic does feature a back-up beeper. 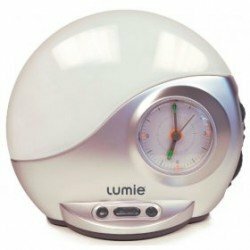 Lumie focuses solely on light therapy and its benefits. As the market leader in this specialist area of health and well-being, users benefit from over 17 years of scientific expertise.